Look what you can do with jars! The following jar gift ideas are so super quick and easy, you'll love them. Jars are fun! In fact, there are a ton of awesome gifts you can make using canning jars and other glass containers. Glass jars can be used to present gorgeous gifts... from food gifts to homemade bath and body and more. 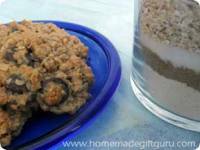 In the past, I've posted classic gift in a jar recipes (such as these Double Chocolate Cookies in a Jar and Old Fashioned Oatmeal Cookies in a Jar). The ideas below are the simplest of simple! They are quick, easy and super cute. Some of them even come with free printable gift tags. Enjoy! Psssst... Attention parents, aunts, uncles, grandparents and teachers... Don't forget to get the kids involved! Kids love to help with these homemade gifts. 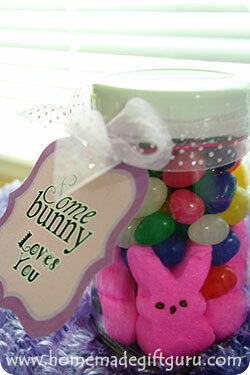 Candy is a fun and super simple gift you can give in a jar. You can use canning jars or you can find other food safe jars by re-purposing nice looking glass (get tips!) from your fridge and pantry. Candy in a jar ideas can range in size from little baby food jars to large gallon sized jars, depending on the what, who, why of your gift giving needs. 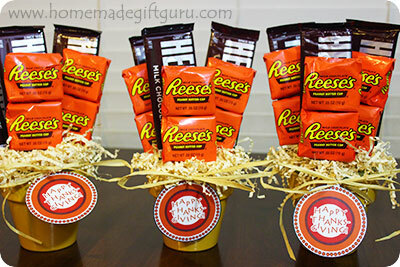 Easy Valentine's Day Gift in a Jar "I Love You to Pieces"
Fill a jar with your favorite Reece's Pieces candy. Attach a gift tag that says, "I love you to Pieces!" Saint Patrick's Day Gift in a Jar "I Treasure You"
Start any sized jar by adding several gold foil packaged candies, such as gold foil chocolate coins or Rolo chewy caramels in milk chocolate. Then use sorted skittles to make a rainbow with the red, orange, yellow, green and purple. Top the jar off by filling the rest with white mini marshmallows. Attach a gift tag that says "I Treasure You! Happy St. Patrick's Day"
or "I'm so Lucky to Know You" "You're the pot of gold at the end of my rainbow"
Peeps marshmallow treats are a super fun way to cutesy up your candy in a jar gifts for Easter. 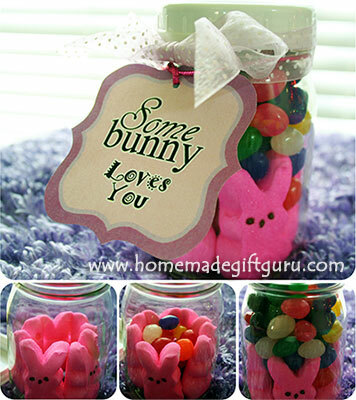 "Happy Easter to all my PEEPS"
You can also let somebunny know you are thinking of them by attaching one of these Somebunny Loves You gift tags to a mason jar full of bunny shaped peeps and colorful jelly beans. With Halloween comes a whole new selection of Peeps for Peeps in a Jar Gifts! 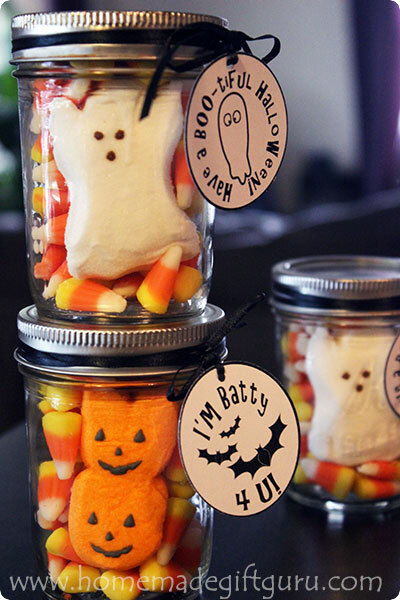 The pumpkin Peeps and the ghost Peeps fit perfectly inside regular mouth half pint size canning jars. The above ideas are just a few of my examples. 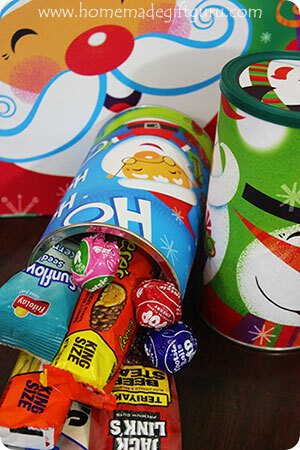 You can make a candy gift jar for any occasion! Sometimes, sugar just ain't the answer! One thing that can take it's place with amazing style and cleverness... is nuts. If you know someone who is nuts about nuts or someone who will appreciate a more natural wholesome gift, these nutty nut gifts may be the answer. Homemade or store bought flavored nuts, such as barbecue almonds or chili-lime peanuts. For a sweet but still wholesome gift, try making some scrumptious glazed nuts. Then, write something NUTTY on the gift tag, like... "I'm nuts about you" or "From one nut to another" or "Let's go nuts together"
For special occasions try... "GO NUTS! It's your birthday :)" or "Nuts for my... daddy!" or for my mommy, Nana, Papa etc. That's it for these SIMPLE jar gifts. I hope you have a SWEET time making and giving these easy homemade gifts. Helpful Tip... You may also want to print some of my free "made with love" tags for your homemade gift project. There's a lot more than just candy that you can give in a jar... Learn more about the many gift jar ideas here!